Updated at 11:24 p.m. ET on Feb. 6, 2019 to add a link to a video of The Heritage Foundation discussion. (Washington, D.C.-Feb. 6, 2019) A ChinaAid delegation met with numerous organizations and political offices in Washington, D.C., yesterday in order to spotlight the urgent need for international government intervention in Chinese human rights abuses. 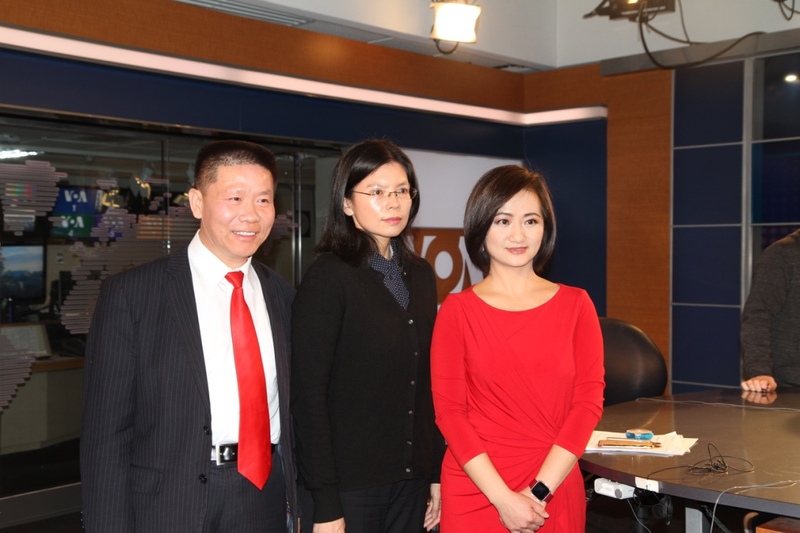 The day began when ChinaAid President Bob Fu and Li Chingyu, the wife of imprisoned Taiwanese human rights activist Li Mingche, participated in a Voice of America interview. 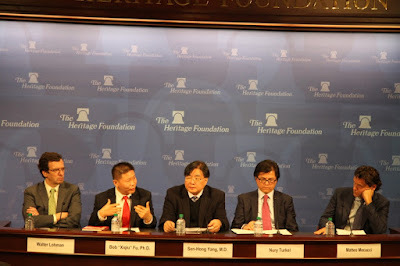 Afterward, the group made their way to The Heritage Foundation, where Fu and Taiwan Association for China Human Rights leader Yang Sen-hong joined Chairman of the Uyghur Human Rights Project Nury Turkel, and President of the International Campaign for Tibet Matteo Mecacci, for a panel discussion on China’s human rights and religious freedom abuses. The panel was led by Dr. Walter Lohman, the director of the Foundation’s Asian Studies Center. During the panel, Fu highlighted the fact that, according to ChinaAid documentation, 2018 was the worst year for Christian persecution in China in 40 years, increasing 36-fold since 2017. He underscored many persecution cases, including that of Early Rain Covenant Church, and said that 50,000 Chinese Christians had been tortured physically and mentally in the past year. Fu also emphasized that people from many different backgrounds have been persecuted by the Chinese regime for their beliefs, including the Christians, Uyghur Muslims, and Tibetan Buddhists represented by the panel, and that these faiths should unite together against persecution. an interview at Voice of America. “To attack and persecute one group is to attack all of us,” he said. Yang brought up Taiwan’s unique position, as a nation that China has stated its intent to govern as “one country, two systems” and essentially bring it under the control of the Chinese Communist Party. Taiwan’s president, Tsai Ing-wen, firmly opposes this action, as do many Taiwanese citizens. Yang also mentioned Li Mingche, who was imprisoned in China for “inciting subversion of state power” when he advocated for Chinese human rights, even though he did so within Taiwan. Li Mingche is currently serving a three-year prison sentence. Nury Turkel exposed the abuses China is currently enacting against Uyghurs in Xinjiang, where more than 1 million people have been held in “re-education camps,” where inmates are often tortured, starved, and brainwashed. He said the government has also imposed strict laws against having traditional Uyghur Islamic names. A ChinaAid delegation meets with U.S. According to Turkel, the Chinese government views Uyghur existence as a threat and is trying to wipe out Uyghur identity, and Islam is a large part of that identity. Already, mosques are closed, crescents have been removed from worship places, and Quranic verses have been altered to more closely align with the Communist Party’s agenda. In addition, people working on behalf of the government are being stationed in Uyghur homes and encouraging children to spy on their parents’ activities. Mecacci and brought into question how China, as a major world player, could reorient international values and morals if allowed to continue their abuses unchecked. He also discussed the plight of Tibetan Buddhists, whose temples are being monitored, and some of whom are setting themselves ablaze and dying in protest of the Chinese government’s rule. When asked what actions can be taken, Turkel replied, “Public naming and shaming is one of the most important tools” and elaborated that international communities should call China out on its abuses, because China still cares about its reputation. Mecacci said there should be reciprocity when it comes to freedom of information; if China wants to have news organizations running in the U.S. and other nations, which they already have, they should not block reporters’ access to news happening in China. 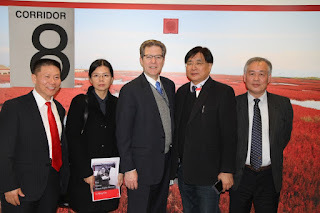 At 1:00 p.m., the delegation met with the Ambassador-at-Large for International Religious Freedom Sam Brownback, and Li Chingyu shared her husbands’ story. 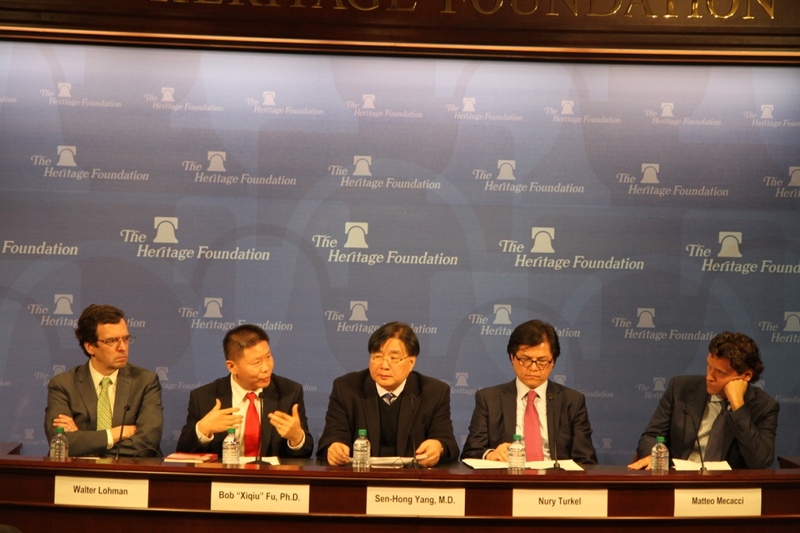 The group also discussed what the U.S. government can do to induce lasting change, and Yang emphasized the importance of America pressuring Taiwan to pass a refugee act that would allow victims of China’s abuses to seek sanctuary in the country. 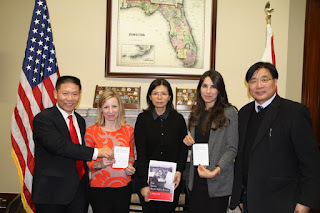 Afterward, the group met with Elyse Anderson from the Congressional-Executive Commission on China and detailed to her various stories of abuse, letting the Commission know details of the best courses of action to take in order to secure human rights and religious freedom in China.